Old Man's War, by John Scalzi, is a book I've wanted to read for a while. This premiere novel by Scalzi follows in the tradition of such military science fiction novels as The Forever War, Ender's Game, and Starship Troopers. Needless to say, I went in with high expectations. While I wasn't disappointed, once the story got rolling it followed a fairly predictable pattern. 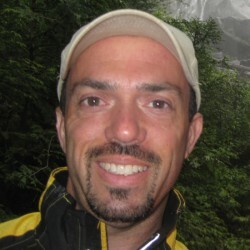 Scalzi is a prolific blogger with a twenty year publishing history behind him. Old Man's War was nominated for the Hugo Award for Best Novel in 2006. 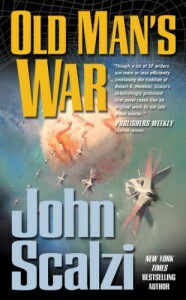 It is the first book in a series set in Scalzi's futuristic world, though Old Man's War is a complete story unto itself. Subsequent books in the series include The Ghost Brigades, The Last Colony, and Zoe's Tale. The story is this: John Perry, a 75 year old widower, Earth-bound his entire life, enlists with the CDF—or, Colonial Defense Force—in exchange for the promise of a new, youthful life. The catch is that no one who enlists knows for sure how the CDF accomplishes their end of the bargain. But with nothing keeping him on Earth, Perry signs on the dotted line. Next thing he knows he's off into distant space. The CDF keeps their end of the bargain and more, but there's a catch: in exchange for his new life, Perry and others like him must commit the next ten years of their lives to service in the CDF as a frontline soldier. Turns out the universe is not a very nice place, and humans have lots and lots of enemies. It is therefore the CDF's primary responsibility to protect human civilizations and colonies and to wage war on any alien species that endangers Man's predetermined right to colonize space. Scalzi does a fine job detailing John Perry's emotional turmoil over letting go of his old life. We're also treated to a sometimes humorous, sometimes grave rendition of what a futuristic boot camp might be like. From there, the story largely follows Perry's training, the friendships and bonds he forms, and his subsequent assignment and advance through the ranks. There are battles worthy of any military sci-fi novel and a menagerie of aliens, all quite nasty and most certainly not friendly to Perry and his fellow soldiers. Where Old Man's War stumbles is in certain aspects of the narration. The story is told in the first person from Perry's perspective, and while this works wonderfully in certain places, like when Perry begins to learn what the CDF is all about and what it's up against, it's not so good in others, as in when Perry finds himself in the thick of things. Scalzi ignores the "show, don't tell" rule, and slips into a telling sort of style that is ultimately too much of a detachment from what's going on, which is exactly the opposite of what I expected given that we're being told the story from Perry's perspective. That's not to say that Old Man's War isn't a good novel. It's entertaining, with an interesting and sometimes terrifying gamut of alien civilizations and a vision of what our own future might be like someday if and when we begin colonizing space. There's plenty of humor, too, with Scalzi's colorful master sergeant character leading the ranks of supporting characters. I was reading some of his lines out loud to my wife who, as former Army, got a good laugh, too. Science fiction is not my usual thing, but I found Old Man's War an enjoyable read and I've already got the subsequent novels on my future reading list.